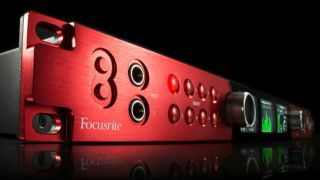 Not so long ago, Focusrite announced the release of its best audio interface yet, the Red 4Pre. Well, the company has just upped the ante by dropping the new Red 8Pre. The new flagship model boasts even greater amounts of I/O. There are 64 inputs and 64 outputs, including a total of 16 analogue inputs and 18 analogue outputs. As the name suggests, the 8Pre features eight specially-developed 'Red Evolution' mic pres with up to 63dB of ultra-clean gain, -129dB EIN and individual phantom power. Alongside setting recall, stereo linking, HPF and polarity invert functions, there is the 'Air' mode, which is an analogue emulation of Focusrite's heritage ISA preamp characteristics. The Red 8Pre includes dual Thunderbolt 2 ports for daisy-chaining drives and displays whilst connected to your DAW. Pro Tools users can connect directly with the onboard dual Pro Tools | HD DigiLink. If Dante is your thing then the dual Ethernet ports connect any Dante-compatible product, such as units from Focusrite's own RedNet range, adding up to 32 channels of I/O. Every Red 8Pre comes bundled with the Focusrite Control software, allowing mic preamp control and the quick setup of mixes and monitors, as well as the Red plugin suite and Softube's Time and Tone bundle. The Focusrite Red 8Pre will be available from dealers for $3499.99 and more information can be found on the Focusrite website.